Tumblr Welcomes Vine Video Embeds: Tumblr users can now embed Vines directly onto their Tumblr blogs. The announcement was made over Twitter on July 10th. Embedding a Vine into Tumblr is as some as pasting a Vine video’s URL or embed code into Tumblr’s video post box. 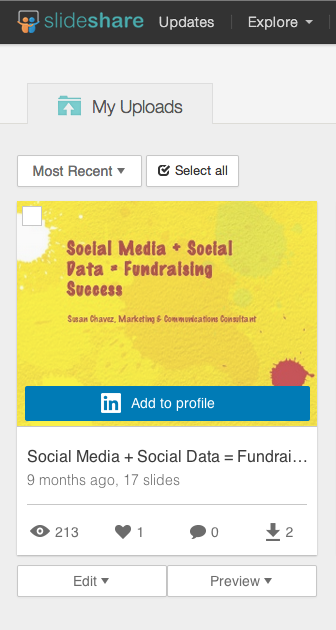 SlideShare Presentations Now Easier to Add to LinkedIn: SlideShare has added a LinkedIn share button for users. 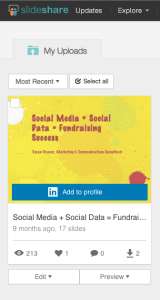 The feature is available for users who have connected their SlideShare accounts to LinkedIn. Once connected, users simply have to navigate to “My uploads” and hover over any of their presentations until the “Add to profile” button appears. The Most Socially Engaged Companies Have Socially Engaged Leadership: Over 50% of the most socially engaged companies on LinkedIn have leadership that uses and encourages employee use of social media. Employees at social engaged companies are more likely to report feeling inspired and stay with their employer. The finding comes from a study conducted by LinkedIn in partnership with the Altimeter Group. The study was based on employee engagement data from LinkedIn.